The Universal Declaration of Human Rights (UDHR) is a milestone document that set out, for the first time, fundamental human rights to be universally protected. The thirty articles that comprise the UDHR underpin international human rights law and provide a common global standard for human rights at the country and regional level. 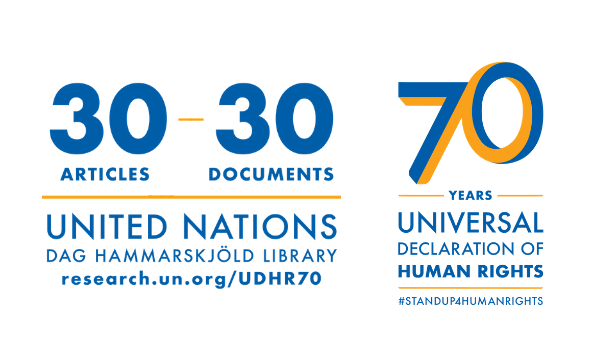 To celebrate the 70th anniversary of the signing of the UDHR, the Dag Hammarskjöld Library is presenting an exploration of thirty key documents related to the thirty articles that constitute the Declaration. The Declaration is the most translated document in the world, available in more than 500 languages. Adopted by General Assembly resolution 217 A (III) on 10 December 1948, it is still just as relevant in our world today. To find out more about the drafting and history of the UDHR, explore our research guide, available in English and French, and read our Ask DAG FAQs.